After creating your FLAMINGOS-2 observations, please check the Checklist. If you still have questions, submit a HelpDesk query. Choice of one of the built-in focal plane units is made by clicking on the pull down lists (i.e. the down-pointing arrows) and selecting the desired unit. The built-in focal plane units included various longslits and calibration pinhole masks. For imaging, the focal plane unit should be set to "Imaging (none)". For MOS observations select the " Custom Mask" option. If the observation is an image that will be used for a MOS design then please put a check mark on this check box. The filter is chosen by clicking on the pull down list (i.e. the down-pointing arrow) and selecting the desired filter. The filter names are listed on the F2 filter pages (ignore the 5 character Gemini reference label). 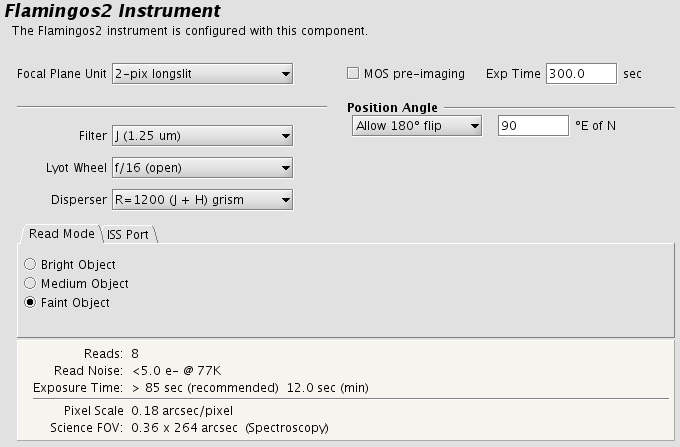 In spectroscopic mode, select the suitable filter for defining the spectral region of interest based on the desired spectral resolution (choise of grism as shown in the Grisms pages). A filter is always needed and the " Open " is not allowed. The filters JH and HK should not be used for broad-band imaging. The filter Y should not be used in spectroscopy mode. The LW position is chosen by clicking on the pull down list (i.e. the down-pointing arrow) and selecting the desired Lyot setting. The only option currently available for science observations is " f/16 (open) ". The other options are for engineering and future applications only. The choice of grism (for spectroscopy) or None (for imaging) is made by clicking on the pull down lists (i.e. the down-pointing arrows) and selecting the desired item. The grism names match those listed on the Grisms pages. If a grisms is chosen, a filter should also be chosen to provide the desired spectral coverage and resolution (see the Grisms pages for the available options). The facility Cassegrain Rotator can rotate the instrument to any desired angle. The angle (in conventional astronomical notation of degrees east of north) is set by typing in the "Position Angle" entry box. 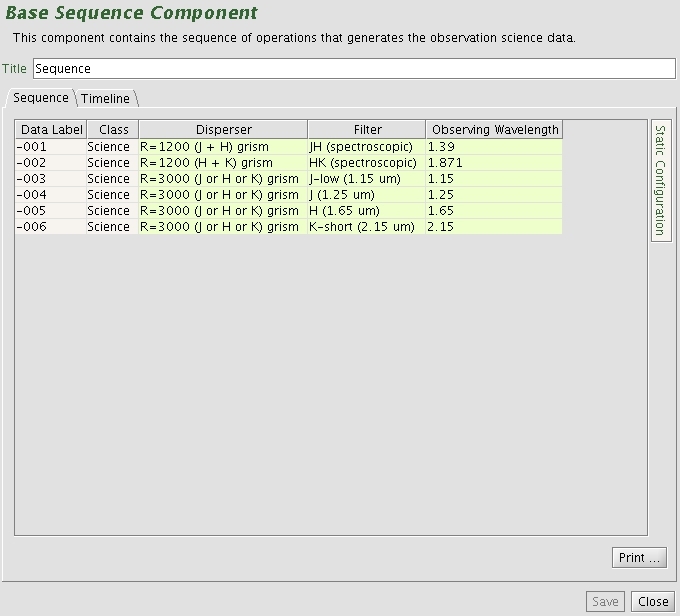 The view of the science field in the position editor will reflect the selected angle. Alternatively the angle may be set or adjusted in the position editor itself by interactively rotating the science field. Select "Fixed" for a fixed position angle or "Allow 180o flip" to allow for a +/- 180 degree change when automatically selecting a guide star. Users may also elect to use the average parallactic angle in order to minimize the effects of atmospheric differential refraction. This is recommended for long-slit observations where the position angle is otherwise unconstrained. When the"Average parallactic" option is selected, the nighttime observer will use the "Set To" drop-down menu to calculate the airmass-weighted mean parallactic angle. It is recommended that PIs set the PA to 90 for observations using the average parallactic angle and verify that a guide star is available. If no guide star is available with the OIWFS, the default guider should be changed to PWFS2, keeping in mind that flexure may require reacquisitions for observations longer than ~45 minutes. Note that the average parallactic angle option is only available for longslit observations. The exposure time is set typing the number of seconds in the "Exp Time" field. The exposure time depends on the chosen " Read Mode ". This choice defines the minimum acceptable exposure time. There are 3 preset read modes. Each mode has a different read noise and overhead defined by the number of Correlated Multi samplings needed. The Bright Object mode is for bright objects and consists of one CDS read. Medium Object mode is an intermediate setting and consists of four CDS reads. The Faint Object mode is for the faintest objects and offers a low read noise and 8 CDS reads. Due to hardware clocking limitations Faint (Medium) Object mode can be set only for exposure times longer than 85 (21) seconds. Short exposures should always be set to bright mode readout (i.e. 1 CDS read). 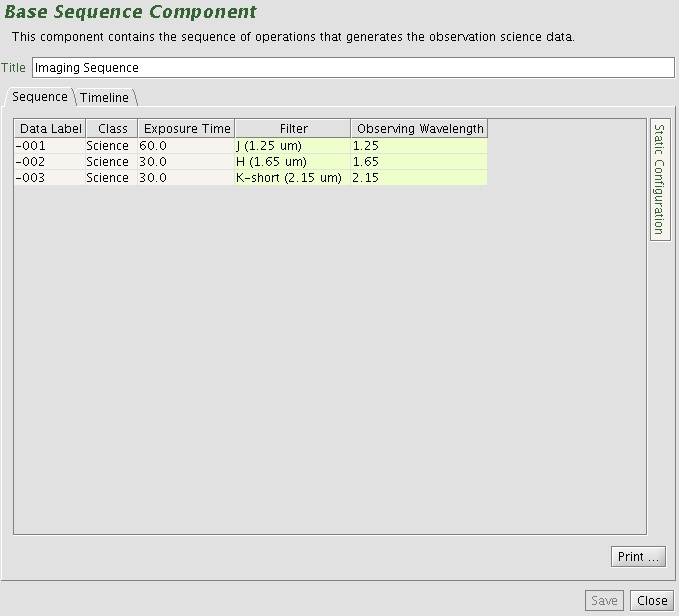 A common source of time loss during the observation is a sequence which has the Flamingos-2 static component defined for faint (or medium) brightness object because the first exposure is longer than 85 (or 21) seconds, and somewhere in the middle of the sequence a shorter exposure is requested. This fault yields the detector controller unresponsive. If mixed readout modes are necessary in the same sequence, then specify the corresponding readout mode for each step in the sequence. The location of the F2 OIWFS patrol field on the sky depends on which ISS port on the telescope has F2 mounted. Normally F2 is mounted on the "side-looking" ISS port. The OT has this selection as its default. It is important to make sure that the correct ISS port is selected for the current semester, since it affects whether the selected OIWFS guide star can be reached. The F2 Iterator is a member of a class of instrument iterators. Each works exactly the same way, except that different options are presented depending upon the instrument. Below some of its features are shown in two examples. The first example is for imaging, the second example for longslit spectroscopy. 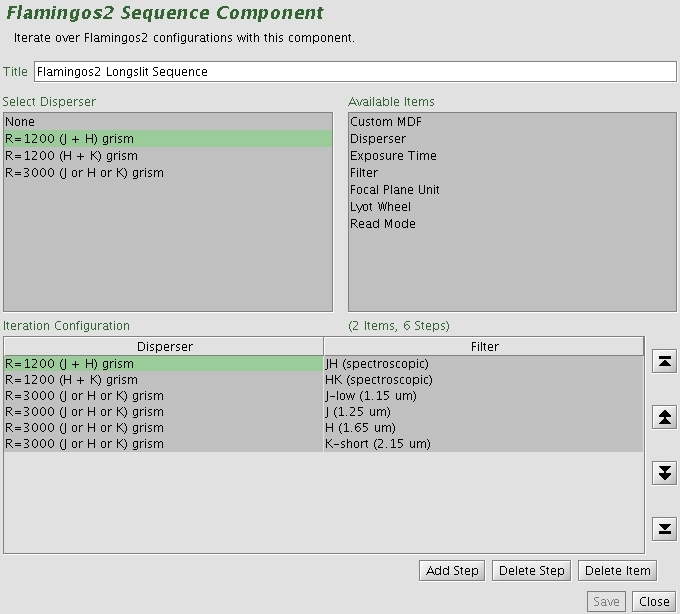 The iteration sequence is set up by building an Iteration Table. The table columns are items over which to iterate. The items that are available for inclusion in the iterator table are shown in the box in the upper right-hand corner of the F2 Sequence Components figures below. Selecting one of these items moves it into the table in its own column. Each cell of the table is selectable. The selected cell is highlighted green. When a cell is selected, the available options for its value are displayed in the box in the upper left-hand corner. For example, when a cell in the filter column is selected, the available filters are entered into the text box. When a cell in the exposure time column is picked, the upper left-hand corner displays a text box so that the number of seconds can be entered. When a cell in the "Custom MDF" column is picked, the upper left-hand corner displays a text box so that the mask MDF name will eventually be entered (not available yet). In this example the sequence iterates over filters and exposure times so there are two corresponding columns in the table. Table rows correspond to iterator steps. At run time, all the values in a row are set at once. Since there are three steps in this table, an observe element nested inside the F2 iterator would produce an observe command for each filter using the specified integration times. In this example the sequence iterates over all combinations of grism and filter for spectroscopy so there are two corresponding columns in the table. Table rows correspond to iterator steps. At run time, all the values in a row are set at once. Since there are six steps in this table, an observe element nested inside the F2 iterator would produce an observe command for each of six steps. F2 is equipped with an on-instrument wavefront sensor (OIWFS). The region accessible to the OIWFS has an " asymmetric lens " shape, partly inside the imaging field of view, see the F2 OIWFS page for details. The OIWFS arm vignettes a small part of the field of view if a guide star inside the imaging field of view is chosen. The vignetting and the region accessible to OIWFS can be viewed with the position editor by using the Field of View: OIWFS item in the position editor menu bar. An example of this is shown in the figure below; the accessible patrol field is outlined with the red dashed line and the projected vignetting of the OIWFS is shown shaded in red. If multiple offsets are defined the green dashed line delineates the region within which valid guide stars may be selected, showing the intersection of the accessible patrol field for all the offset positions. The example is shown for F2 on the side-looking ISS port.